Welcome to Texas Red Hot Rooster Co.
Texas Red Hot Rooster Co. was created by Connie Ollive & Deborah Clark. 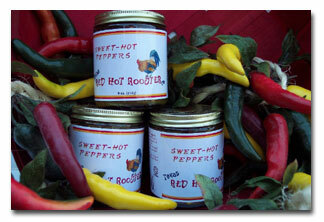 We had the idea of making a recipe of Sweet-Hot Peppers which our friends and family loved. This wonderful blend of sweet flavors and mild to medium peppers is now available to everyone. The creation of other products is in the making and we look forward to bringing you new and exciting flavors. Please check back regularly to see what has been cooking in our kitchen. Be sure to visit the Recipe page for new ways to spice up your favorite recipes or try one of ours. We don't mean to BRAG, but some of our products won some fantastic awards recently! prestamos online rapidos sin papeleos . pożyczki za darmo . prestamos personales sin buro de credito por internet Мы предлагаем всем желающим купить диплом в Чебоксарах в нашей компании http://goznak-diplomss.com и выполним заказ без предоплаты.